We don’t miss much in the lead-up to the NFL Draft. Honestly, there’s probably too much time between the end of the college football season and the selection night. So much that we end up discussing the same storylines over and over again in the weeks before the end of April in order to avoid talking to our loved ones or god forbid, turn off the Wi-Fi and go outside. Normally, we have it all covered. Yet, as April officially gets rolling, it does feel like at least one wide receiver prospect hasn’t received his due time in the spotlight. Since Anthony Miller sat out both the Senior Bowl and on-field drills at the combine with a foot fracture, we haven’t heard his name bandied about as much among the top prospects in the class. However, when you look at the intriguing blend of skills he can bring to an NFL offense’s table, it’s clear the time has come to change that. Games sampled: UCLA, UCF, Connecticut, SMU, UCF(2), Iowa St. The Memphis senior is one of several receivers in the class to try their hand at playing inside. However, unlike receivers like DaeSean Hamilton and Christian Kirk, he split his time between the interior and exterior receiver spots. Miller took 43.7 percent of his sampled snaps from the slot. He split time between the outside left (23.9 percent) and right (31 percent) when he wasn’t in the slot. The Memphis offense typically assured he saw a free release at the line of scrimmage, as he lined up off the line of scrimmage on 73.1 percent of the snaps in his Reception Perception sample. When he moves to the next level, Miller’s most optimal position will be in the slot. He’s already familiar with getting looks from the inside. The fact that he does have experience lining up outside as a flanker does make him more valuable. If Miller can be a flanker who moves inside in spread formations, that will only earn him more playing time as a possible NFL starter rather than just a rotational slot man. Before the days of this injury absence, Anthony Miller was viewed as a potential top-five receiver in this draft class. In fact, NFL.com’s Lance Zierlein spoke to teams who still believe Miller is the safest prospect at the position this year. That opinion is sight unseen based on any pre-draft activities, thus far, so it comes from what they observed of the player on film. Miller’s route polish and technique is surely one item that sells him to NFL clubs. That ability is reflected in his Reception Perception results, as he tests out as an above average separator. Miller posted a 56th percentile success rate vs. man coverage (69.2 percent). While that’s not an elite score by any means, it’s passable considering the role he projects to as a pro player. Where Miller really showed out were the plays when he faced zone coverage. Miller’s 85.1 percent success rate vs. zone coverage cleared the 96th percentile among prospects charted over the last three classes. This was an important result given that we’re discussing a likely slot receiver. In the NFL, receivers who primarily line up on the outside see more attempts against man coverage, whereas slot receivers are left to pick through the holes and crevices of zones in the middle of the field. Miller testing out one of the best receivers at getting open against zone coverage is just what you want to see for a player with his projection. Miller’s success rate vs. coverage results wasn’t all ideal. While he only faced press coverage on 39 of his 198 sampled routes, it proved to be a foil for the senior receiver. Miller’s 56.4 percent success rate vs. coverage tests out at the 35th percentile among prospects charted over the last three years. Again, this is further proof that Miller’s best home will be as a primary slot receiver who can operate outside on occasion at the flanker spot. Allowing him to get a free release by playing that position will help him avoid getting jammed at the line of scrimmage. His poor success rates when facing press were the only true negative result in his testing. If solid but less than perfect success rate vs. coverage scores didn’t leave you feeling too rosy about this prospect, fear not; this is where Miller’s results get interesting. While this player operated mostly from the inside in college, he was anything but some short-area ancillary threat in his offense. We typically see slot receivers operating on patterns that won’t take them far down the field. That was not the case for Anthony Miller. Outside of a high rate (14.1 percent) of screens, we don’t have a relatively high rate of shallow routes. All of the slant, curl and flat came in under the average route percentage for college prospects. On the other hand, we see Miller run intermediate routes like the dig and out consistently with or above the prospect average. 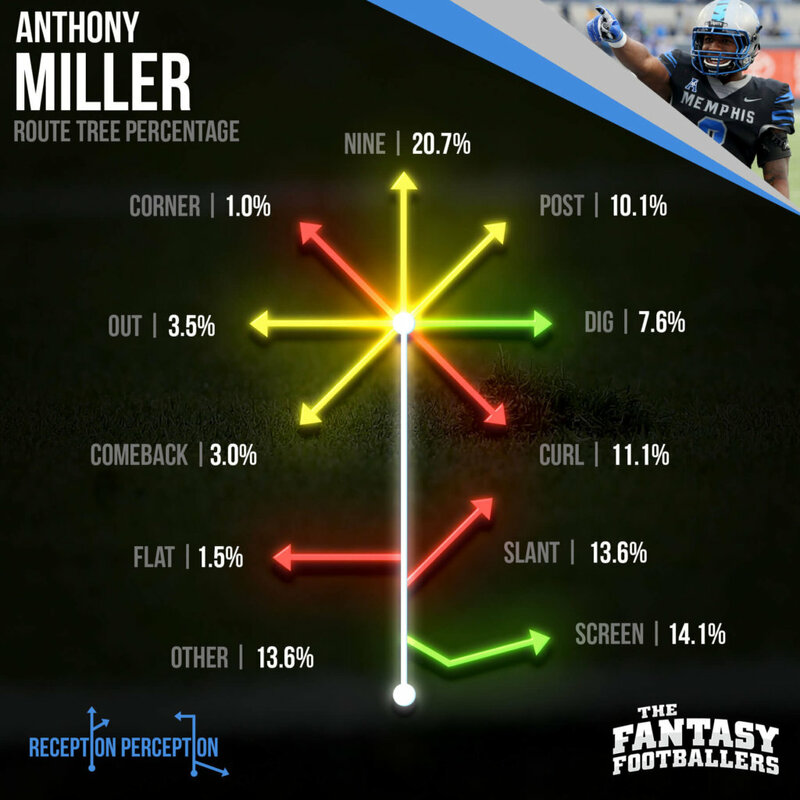 Even more notable, Miller checking at the average for the post (10.1 percent) and nine (20.7 percent) routes show that this was a player who was used as a true vertical receiver in college. And for good reason too. Miller is indeed a big play threat who can win at all areas of the field. The only pattern where Miller checked in under the NFL average was the screen. We shouldn’t need to go into great detail on why that isn’t much of a worry, especially since we see him winning on a variety of different patterns at all ends of the route tree. Miller’s high usage rates on deep patterns are justified by his sterling success rates on posts (75 percent) and nines (58.5 percent). He also tested above the NFL average on intermediate patterns and despite not running them as often as other receivers, posted solid scores on slants and curls. When he likely becomes more of a high-percentage target player at the NFL level, we can have faith Miller will perform on the routes more commonly assigned to slot receivers. However, what makes him different from the typical interior breed is a demonstrated ability to get loose down the field. With that trait in mind, Miller compares favorably to Seahawks receiver Doug Baldwin, another slot receiver who isn’t limited to the shallow areas of the field. Baldwin has been one of the best vertical receivers the last few years since earning regular playing time, and Miller can win in similar fashion in the deep middle of the field. Winning down the field isn’t the only area where Anthony Miller should remind us of Doug Baldwin. The Seahawks wideout excels outside of his frame to win 50-50 balls in tight coverage, and Miller showed he can perform in that area too. Miller checked in at the NFL scouting combine under 6-foot and sub-200 pounds. Yet, he’s just another wide receiver in this class who shows that size is merely a label, not a descriptor of skill. Over 20 percent of Miller’s sampled targets registered as a contested catch attempt (15 total) and he hauled in 73.3 percent of them. That contested catch conversion rate cleared the 78th percentile among prospects charted over the last three classes. Being a great threat on contested passes in tight coverage is what can take a future slot receiver from just a rotational role player in an offense to a featured piece. In addition to his play strength in the air, Miller showed well with the ball in his hands. Miller was “in space” with the opportunity to break tackles on 13.6 percent of his routes in the game sampled, more than any other player in the class charted thus far. The diminutive receiver went down on first contact on just 37 percent of those plays, routinely making at least one player miss. 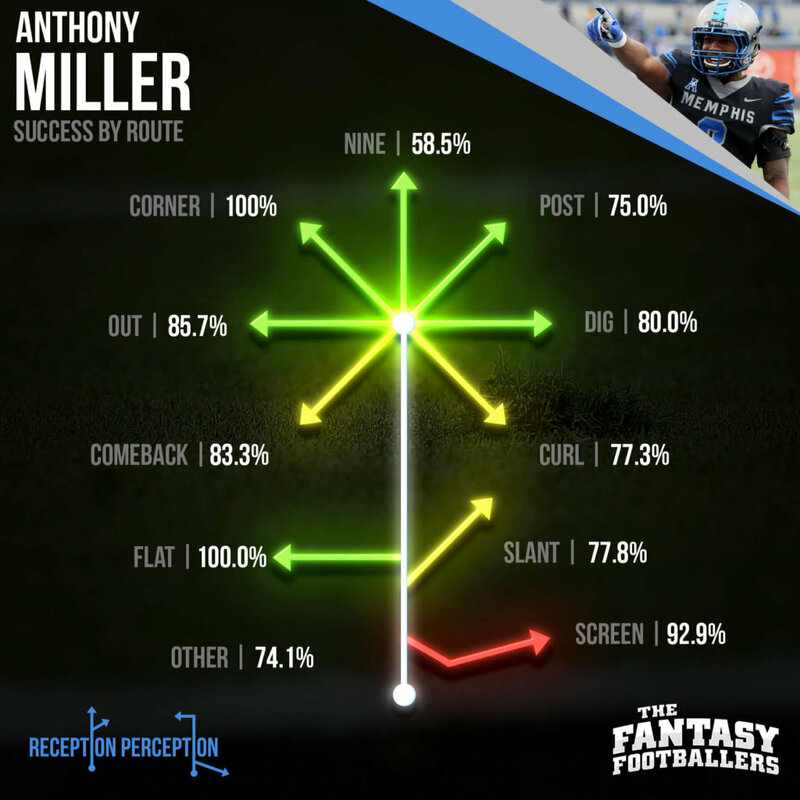 Perhaps Anthony Miller will be “just a slot receiver” at the NFL level. Looking at how he beats zone coverage with great efficiency while struggling against press coverage, it makes sense to slide him into that position. However, this doesn’t look like the run of the mill Cole Beasley slot receiver. Just as some of the best interior receivers do, Miller gets loose in the vertical game, can be trusted on contested catches and makes things happen with the ball in his hands. Some of these Reception Perception metrics help quantify the proverbial “chip on his shoulder” Miller makes known on film and the combative mindset he clearly plays with. It’s these type of traits, along with the ability to blend slot receiver precision with big-play ability, that makes him a receiver we shouldn’t bet against at the pro level. No one should be shocked if he outperforms expectations.